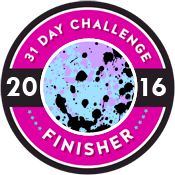 Hmm, that should probably read “33 Day Challenge Wrap-Up,” because I was never, not once, on pace with the challenge themes, and as such, ended the whole thing two or maybe even three days beyond everyone else. 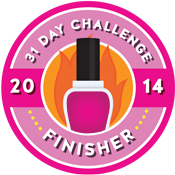 I had a hard time motivating myself in the early days when the challenge prompts were overly broad (blue? 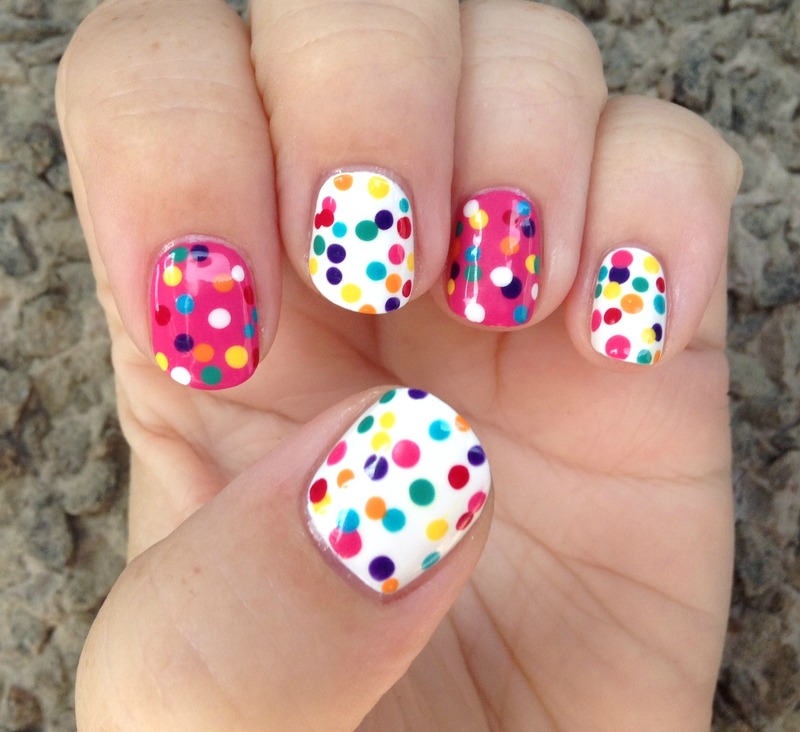 dots? 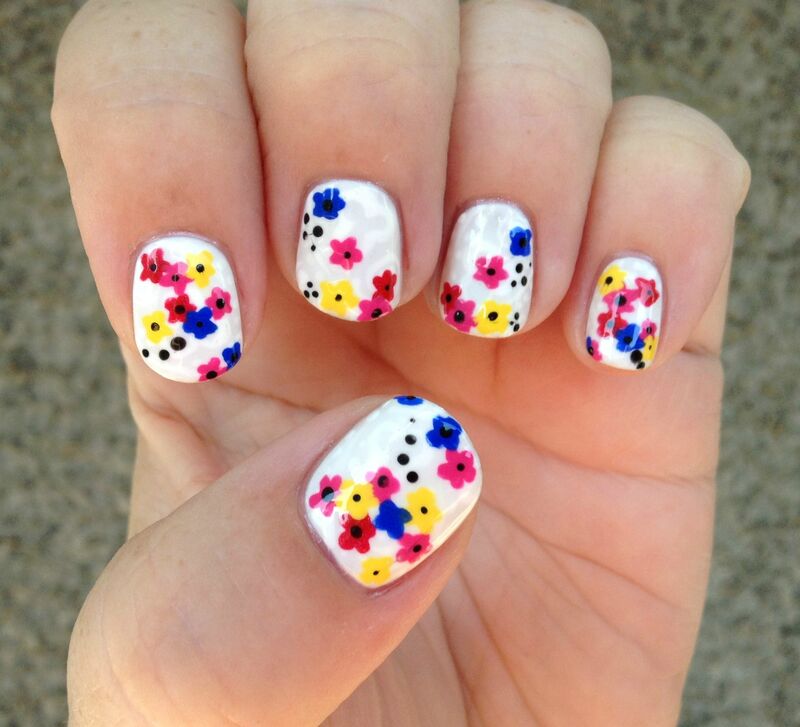 florals?) 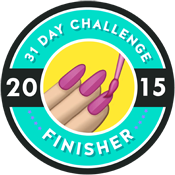 but I like to think I kicked it into high gear in the final two weeks, producing some of my favourite manicures ever, actually. These are eight of my own designs (and one homage) that I think rocked this challenge. And why nine? 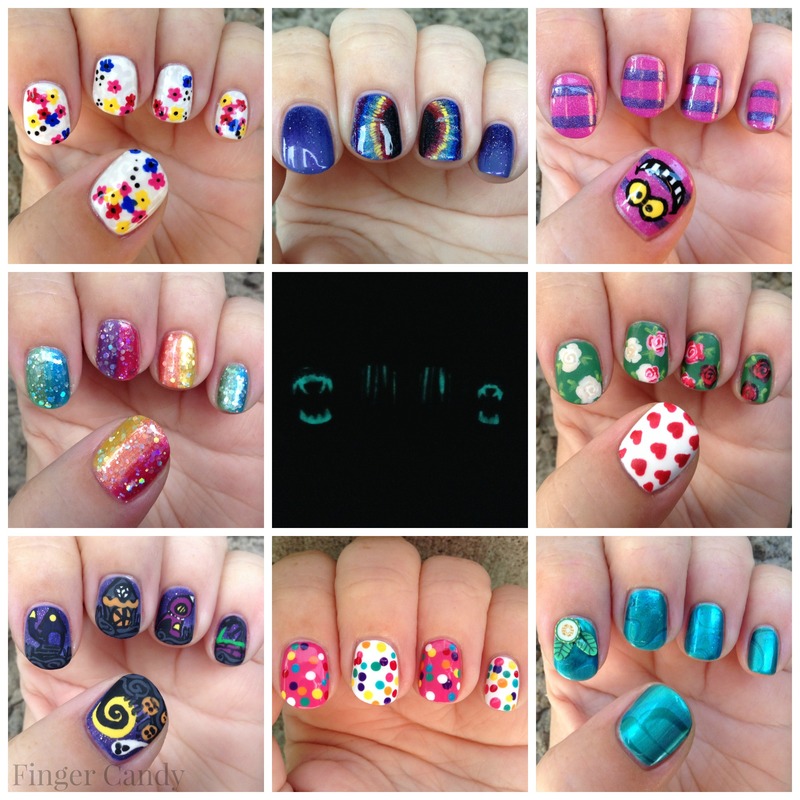 Well, because nine photos make for a more visually pleasing collage, for one, and why not be all random when the original challenge is pretty random in itself (as in the 31 Day Nail Art Challenge takes place every year in a month with only 30 days. Huh.) Enjoy! 1. Lacey, floral nails inspired by a Monique Lhullier dress for day 14’s theme of flowers. 2. Time rip nails inspired by the Stephen King novella, The Langoliers, for day 24’s theme of a book. 3. 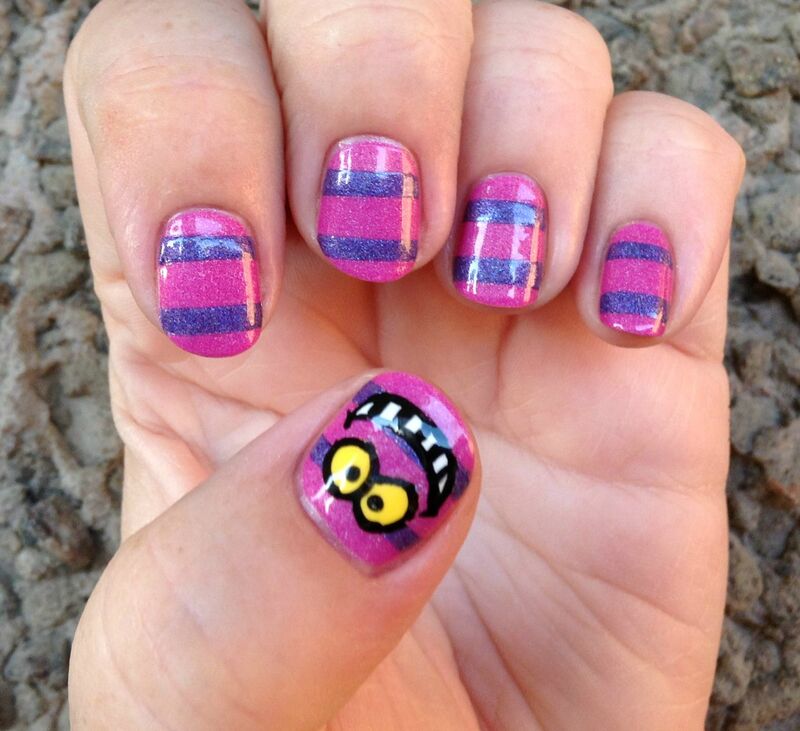 A striped, Cheshire Cat manicure for day 21’s theme of inspired by a colour. 4. 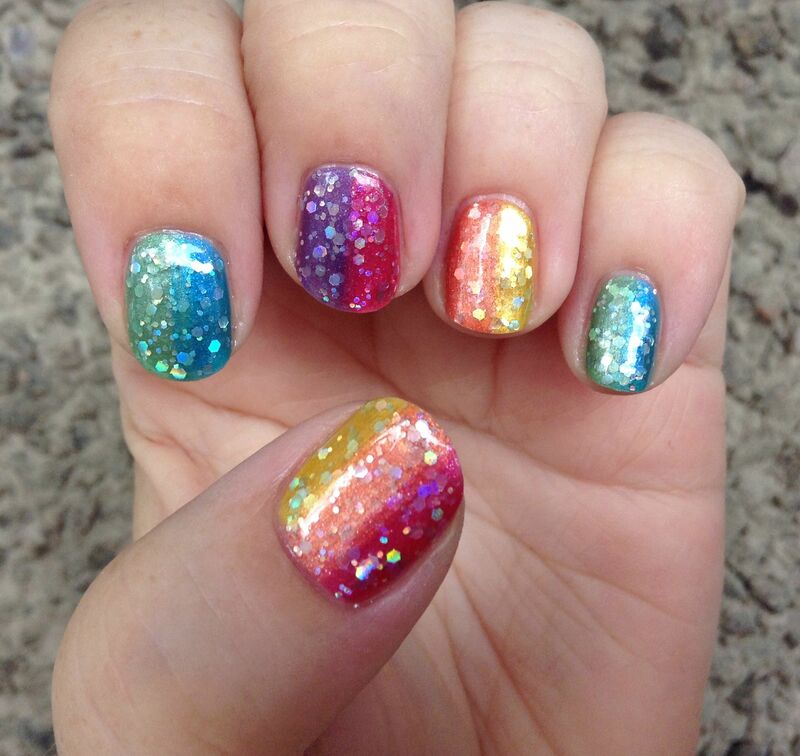 A glittery, rainbow-on-rainbow jelly sandwich manicure for day nine’s theme of rainbow nails. 5. 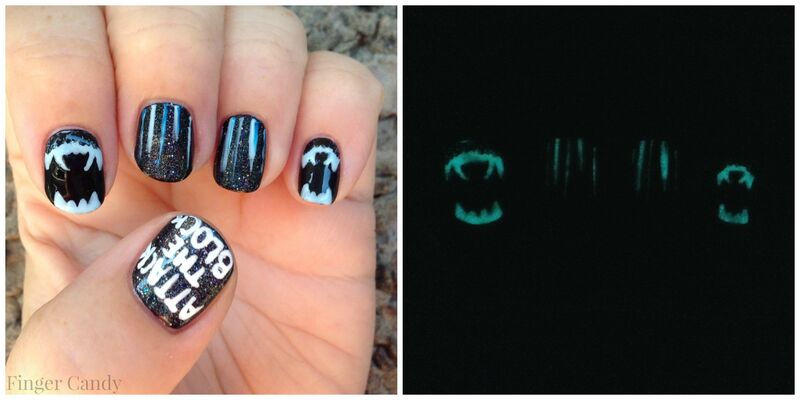 Attack the Block nails, featuring actual blue, glow-in-the-dark monster jaws, for day 23’s theme of inspired by a movie. Ratings! 6. 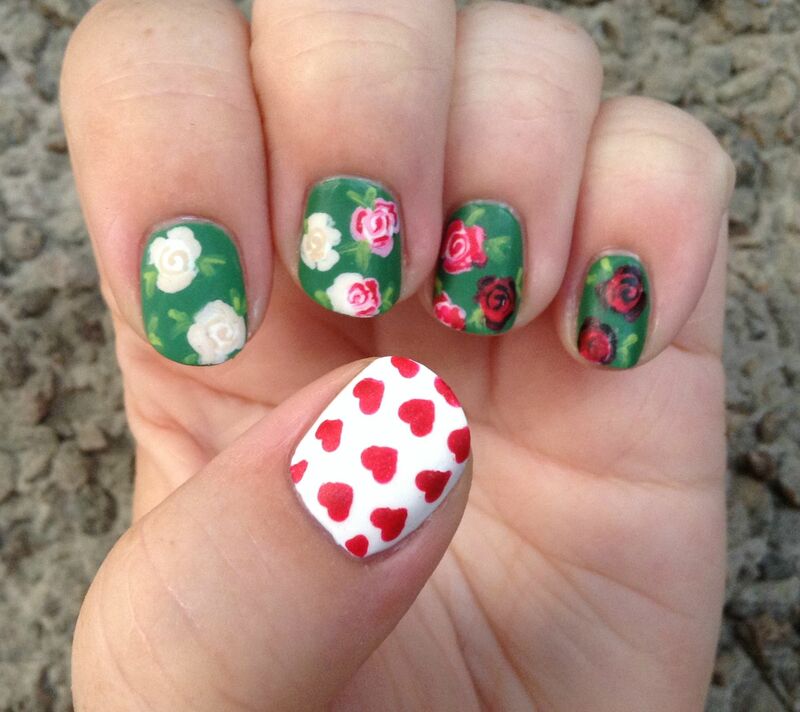 Another Alice in Wonderland-themed manicure, this one inspired by the Queen of Hearts’ preference for blood red roses for day one’s theme of red. 7. 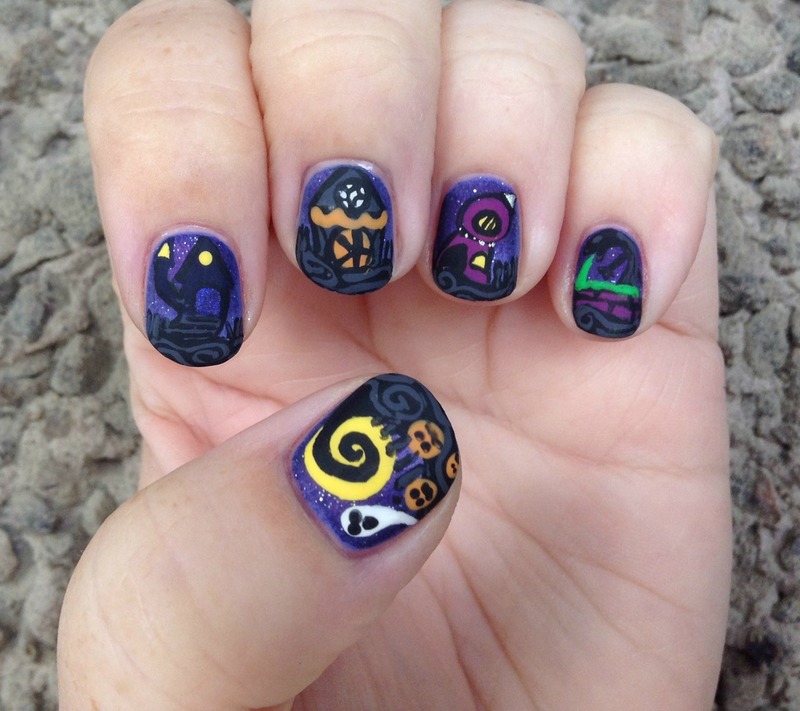 Super detailed Halloween Town nails from The Nightmare Before Christmas for day 29’s theme of the supernatural. 8. A recreation of Chalkboard Nails’ delightfully adorable circus cookie dotticure for day 31’s theme of honouring nails you love. 9. Another watery water marble, this one featuring a little cucumber and mint accent nail, for day 20’s theme of a water marble. 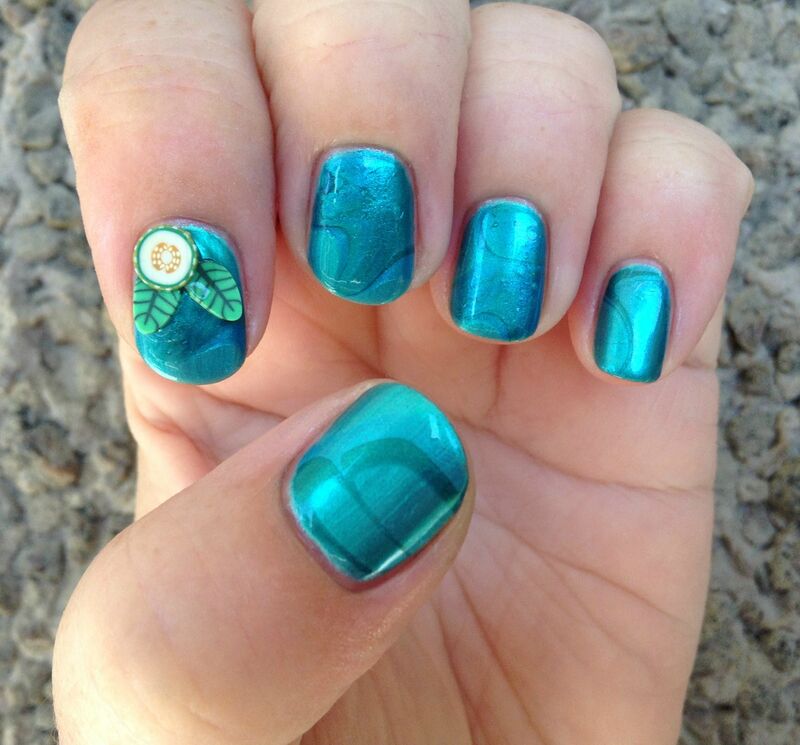 I really enjoyed all of your nail art this week! It is such a hard thing to accomplish, and they each turned out amazingly well. I’m in awe 🙂 Also, Attack the Block was such a goofy movie! Ha! I enjoyed it, IIRC (saw it a few yrs ago). Aw, thank you very much – that’s really nice of you to say. 🙂 The challenge themes were actually the exact same ones as last year’s (and the year before that) – it’d be cooler if there were new challenges every year, but seriously, why am I trying to make work for myself?! And Attack the Block is bah-nanas. Love it so much. I love those goofy sci-fi/horror movies! Nothing too scary, though. I’m a wuss! Ahh don’t undersell yourself like that! 😀 But even if you didn’t actually invite anyone to join, it’d be fun to see you do challenges on your blog. 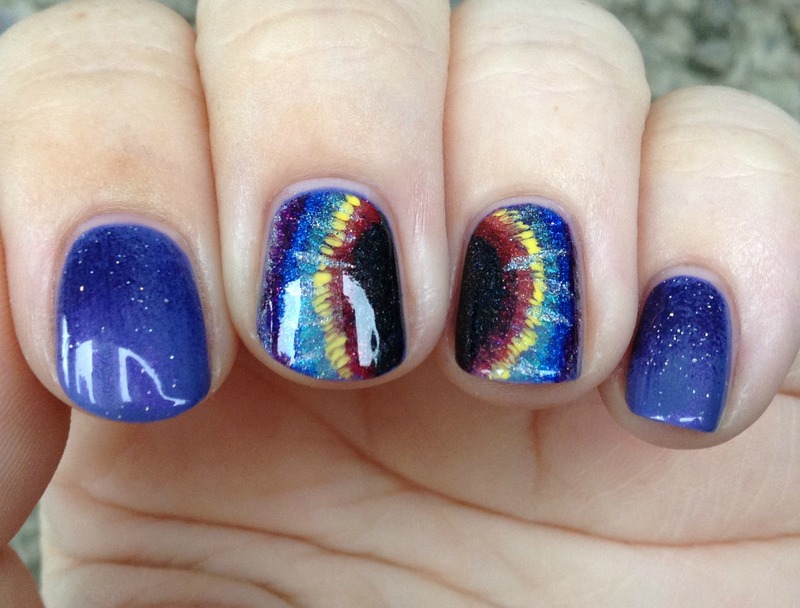 But either way, you do some fantastic nail art and I always love to see what you’ve just come up with! I’ve been trying to get myself to watch more horror movies this month, but all I’ve managed is re-watching The Faculty and part of Final Destination 3! Oh, I know – that was so mopey! But really, it might be a great way to get to know more people and their blogs – people love a good contest. I just watched The Faculty last night! It’s so underrated. And what an odd collection of actors, right?